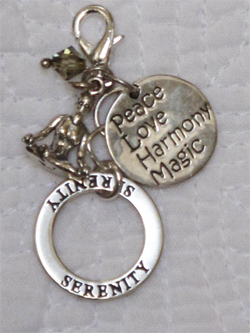 This chi charm is brought to you by Deepak Chopra's commitment to each of the words you see engraved on this piece. I recently signed up for his 21 day free meditation course, and by clicking on this link - http://chopracentermeditation.com/login - maybe you can too. I like the way he shares his view of the 'field of all possibilities'. If anyone can guide us to this field where abundance is plentiful, it's Deepak Chopra. May we all learn to manifest what it is we desire the most ...... namaste fellow seekers.